Don’t worry Hamiltonians, 0-2 is no big thing, really. Friday’s game was entertaining but BC certainly didn’t make things easy on themselves. That said, all facets of the game contributed to the win in some way. Here was my view, from the stands. Once again the offence was hot and cold, although credit has to go to the Ticats as well who have a pretty strong and aggressive defence. Travis Lulay was 17-31 for 178 yards and two touchdowns and that seems to match his performance for the night. He seemed to be just a touch off on his deep throws all night long. He did manage the game well and in particular the last drive of the game (with a huge assist to Andrew Harris). Harris had a big night and while most of it came on two carries, the Canadian running back rose to the occasion, sealing the win fourth quarter and finishing the night with 140 yards on 13 carries. A nod has to go to the offensive line as well for opening the holes for Harris and surrendering zero sacks on the night. 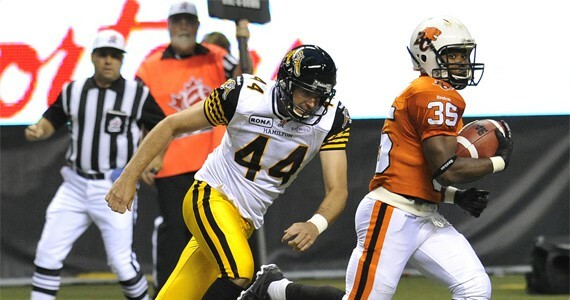 In the first half the Lions defence had Henry Burris off his game. Following an Anthony Reddick interception to set up a Lions score, Burris was pulled to think about things by his head coach, George Cortez, but Quinton Porter was just as ineffective. When Burris returned to start the third quarter, the veteran showed his poise in the pocket and used it to find open receivers, particularly on two fourth quarter drives. The pass defence gave up 359 yards on the night, and they will want to shore things up as they head into Regina next weekend to face Weston Dressler, Chris Getzlaf, Rob Bagg and company. The front four were effective again albeit more so in the first half, but they did rack up four sacks and several hurries on the night. I thought Adam Bighill continued to show well at linebacker, and Anton McKenzie had another strong game. Cover teams continue to struggle and it has to be a concern for the club. Yes it’s still early but this is a problem that has plagued the Lions for the better part of two seasons now. Where cover teams faltered Tim Brown and the return teams excelled. Brown was quick to acknowledge his blockers post game and his 296 combined kick/punt return yards easily made him the player of the game for the Lions. The purpose of my gig here is to relay the view of the game as a fan. That includes the fan experience, which I am happy to say was more comfortable with the roof open tonight. Chris Palliser, on field announcer for the Lions teamed up with Crazy P to try and revive the historic BC chant. They almost got it going too. If they stick with it and maybe get the scoreboard involved, we should be hearing it more prominently in future games. There were just 25,109 in attendance at the game. You have to think the first sunshine of summer had some people heading to the beach, camp grounds and patios. Still, I’m disappointed in the Vancouver sports fan. This is a really good football team who just won a championship for this city. Where is the support outside of the 25,000 diehards that are attending? Hamilton is traditionally a smaller draw, but let’s hope that when Edmonton comes to town this team gets a crowd it deserves. BC Place; Can we please get some beverage service in the seats? Section 243 saw no water, pop, lemonade, or heaven forbid a beer vendor all game long. Thanks.